Explore Nunavut - Information about Nunavut - Explore Canada's arctic! 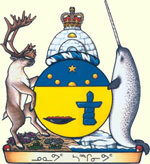 Nunavut means 'our land' in Inuktitut, the language of the Inuit. Its inhabitants are called Nunavummiut, singular Nunavummiuq. Along with Inuktitut, Inuinnaqtun, English, and French are also official languages. Nunavut is the largest and newest of the territories of Canada; it was separated officially from the vast Northwest Territories on April 1, 1999 via the Nunavut Act and the Nunavut Land Claims Agreement Act. The creation of Nunavut marked the first major change to Canada's map since the incorporation of the new province of Newfoundland in 1949. The capital of Nunavut is Iqaluit (formerly Frobisher Bay) on Baffin Island in the east. There are 25 communities spread throughout three regions: the Kivalliq, Kitikmeot, and Qikiqtaaluk. Nunavut is both the least populated and the largest of the provinces and territorities of Canada. It has a population of only about 30,000 spread over an area the size of Western Europe. The territory covers approximately 1.9 million square kilometers of land and water including part of the mainland, most of the Arctic Islands, and all of the islands in Hudson Bay, James Bay, and Ungava Bay (including the Belcher Islands) which were formerly attached to the Northwest Territories. Nunavut has land borders with the Northwest Territories on several islands as well as the mainland, and a tiny land border with Newfoundland and Labrador on Killiniq Island. Arctic tundra covers virtually all of Nunavut. Nunavut's vegetation is partially composed of rare berries, lichens, Arctic Willows, moss, tough grass, and small willow shrubs. The highest point in Nunavut is Barbeau Peak on Ellesmere Island at a height of 2616 m (8583 ft).